the Hottest Creative New Ways to Showcase Your Baby Gift! Designed with Your Special Theme or Colors in Mind! Diaper Cake designed to look like a castle! A baby gift to welcome the newborn home. Special message for your flags. Diaper Bears are a wonderful new baby gift or baby shower gift to give to the new Mommy to be! They are made out of diapers and form the shape of a teddy bear. Each diaper bear comes with a themed baby bib that you can have embroidered with any special theme. Custom Embroidery can be included with any baby gift basket. These customized items include baby bibs, baby socks, blanket, onesie or baby cap. Little Prince or Princess. A wonderful table centerpiece for a baby shower or baby gift. These may also be designed with your special theme in mind. There are many wonderful exciting baby gifts that a new mommy to be would love. Why not try a Diaper Castle! A great way to WOW your guests at your Baby Shower is to decorate with centerpieces for your tables. These items can include Baby Bouquets, Wire Baby Carriages, Diaper Bears, Diaper Castles. Custom Embroidery Diaper Cakes: Have your baby shower cakes designed with customized embroidered baby items. These cake gifts include personalized bibs, onesies, baby blankets, baby socks and caps. Baby's name, birth announcement and theme! A wonderful way to specialize your baby shower cakes or baby gift baskets. 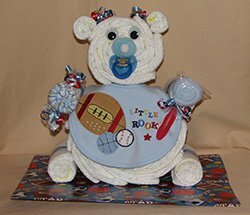 Custom Unique Elegant Diaper Cakes are designed in various cake tier sizes for many themed baby showers. Have your shower cake designed with your special theme and specific budget in mind. Instead give her something she will ALWAYS remember!